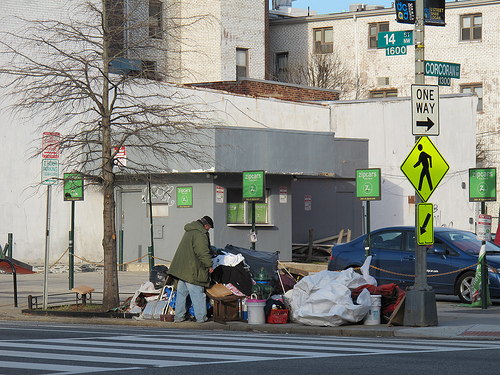 PoPville » At What Point Does This Situation Become a Blight? Back in Oct. ’10, Danny Harris, wrote a People’s District post for PoP about ‘Michael on Finding His Heritage’. I think people will agree it was fascinating and more than a bit sad to learn about the man, Michael, who resides on the corner of 14th and Corcoran St, NW. And I really don’t mean to be callous in asking the question but I couldn’t help but notice the corner seems to be turning into an eyesore. I know there is a homeless shelter (Central Union Mission) for the time being a half block north. The amount of material on the corner seems to be growing. Well, I’ll just get straight to the question – at what point, if any, do you think Michael’s belongings need to be contained or removed?